You are currently browsing the tag archive for the ‘No Borders Network’ tag. The effect of climate change on migration, is one of the largest aspects of social fallout resulting from rampant capitalism’s destruction of the enviroment. On the 7th-18th December a sizeable group of No Borders activists from Wales and the south west joined thousands of others and travelled to Copenhagen to attend the mobilisations at the UN Climate Summit – COP15. 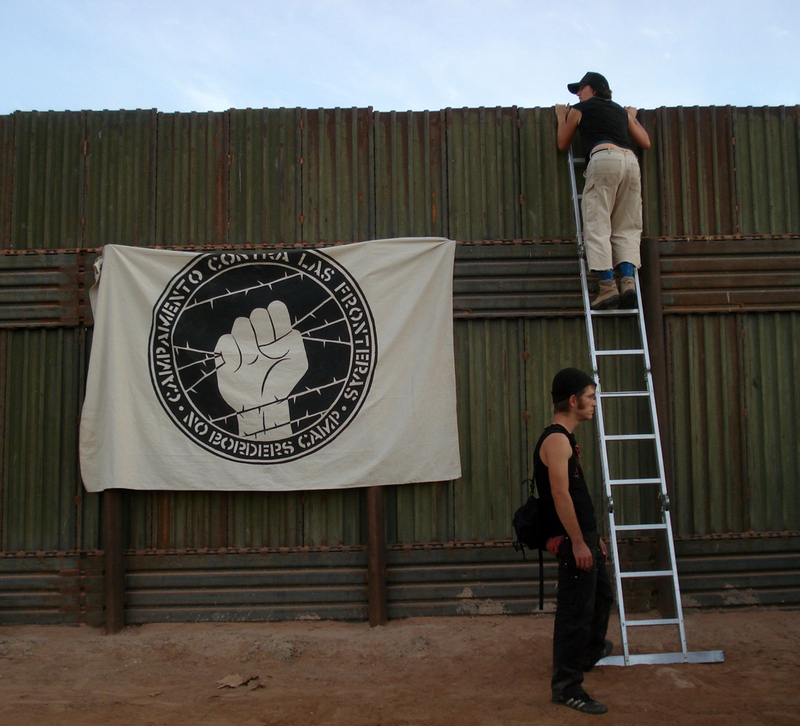 There was a Climate No Borders convergence space at Ragnhildgade, a “No Borders! No Climate Refugees” day of action as well as several talks, workshops, film showings and discussions. On 21st and 22nd February No Borders activists from across the UK will once again gather to discuss and plan together. This will be the fifth network wide gathering, following on from last November in Newcastle, hosted by No Borders North East. This event will be co ordinated by Bristol No Borders and take place at St. Werburgh’s Community Centre (map). Although primarily a coming together of the dozen or so autonomous No Borders groups in the UK, like previous gatherings it will be an open event with no ‘membership requirements’ to attend. However this will be a working meeting of like minded activists rather than a place to find out about the network. Please contact us, or your local group if you do wish to find out more (links to other local groups in the left column). If you are coming, please contact the organisers about accommodation, when you will be arriving, and any other requirements. Though the venue, accommodation, logistics and catering will be the responsibility of people in Bristol, we in South Wales will be compiling the proposed agenda. If you would like to contribute anything please contact us, there will be a finalising meeting on Friday 20th February in Bristol which everyone is welcome to attend. There is a suggested donation of £10-15 to cover the costs of the Gathering, no one will be turned away through lack of funds. On the 8th & 9th November groups and individuals from across the UK affliated to the No Borders Network will meet in Newcastle to discuss and plan together. There will be workshops and discussions on a wide range of issues including reflections on the network, news from local groups, anti-deportation campaigns, targeting airlines, transnational networking, cross-channel border controls, ID Cards for non-EU spouses & students, International Organisation for Migration (IOM), and more. If you’d like more information or you are planning to attend, please contact the organisers via whydontyou@post.com letting them know if you would like accommodation, when you will be arriving, and any other requirements. There is a suggested donation of £10 to cover the costs of the Gathering, but no one will be turned away through lack of funds. There will also be No Borders merchandise such as t shirts, dvds and books for sale.